What is the purpose of the GP evenings? GP education evenings are designed to be held within a radiation therapy department for GPs within the local catchment area. It provides GPs with a face-to-face opportunity to learn about radiation oncology from health care professionals in a centre close to them. The first night was held in October 2014 at Westmead Hospital in Sydney and have since been held in over 30 departments across Australia and New Zealand. Hundreds of GPs have improved their knowledge of the aims, practicalities and the positive impact modern radiation therapy (also called radiotherapy) has had on patient reported outcomes. What is the program for the GP evenings? The program comprises of a presentation delivered by a radiation oncologist, covering the basic principles of radiation therapy followed by 2 clinical cases. The first case is about the indications and benefits of palliative radiation therapy for painful bone metastases and the second case focuses on modern radiation therapy as an effective and well tolerated treatment option for localised prostate cancer. There is also a guided physical tour of the radiation treatment machines, with demonstrations (sometimes live) of set up and treatment, the CT simulator, mould room, a “show and tell” of selected radiation therapy equipment and a “walk through” of the a typical patient pathway through the department. Attendees learn about the indications, technology and practicalities of modern radiation therapy. 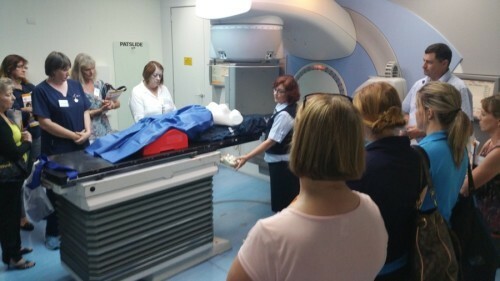 Personalised departmental tours are conducted in conjunction with interactive case-based learning modules which enhance the experience giving GPs (and other health professionals) a unique look at how radiation therapy is safely administered nowadays with millimetre precision. GPs attending the education evenings have given overwhelmingly positive feedback about the quality and usefulness of the session. 100% of all GPs felt the session significantly improved their understanding of RT and would recommend the session to their colleagues. Targeting Cancer has a put together a virtual GP education evening video to allow the busy GP to enhance their knowledge about modern radiation therapy. The videos focus on the role of radiation therapy in general practice and include a tour of the radiation oncology department. Targeting Cancer has a growing body of literature tailored to the busy GP to enhance knowledge about modern radiation therapy. We encourage visitors to download articles on radiation therapy technology advances for localised prostate cancer, brain metastases, high risk cancers and more. Volunteer radiation oncologists partake in contributing to the materials and are often contactable for more information and clinical educational collaborations. Please see Useful Resources to download the articles. PLEASE NOTE: The content published on this website should not be considered as medical advice and is not intended to replace consultation with an appropriately qualified medical professional. Disclaimer: This website may contain the names and images of people now deceased.